West Windsor, N.J. -- Super Bowl Sunday has become a tradition of another sort for thousands of female athletes across the country. In New Jersey a special ceremony and luncheon held at Seton Hall University marked the 25th Annual National Girls and Women in Sports Day Feb. 6. 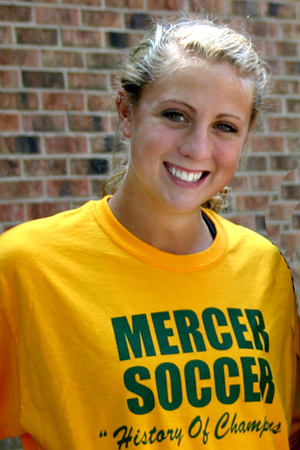 Sophomore soccer player Marissa Segal, of East Windsor, represented Mercer County Community College at the event. In addition to her parents, Segal was accompanied by Head Soccer Coach Jodie Ricciardi and Assistant Coach Mike DeAngelis. Segal says she was honored to be selected. "When Mr. Simone [MCCC Assistant Dean John Simone] told me, I thought it was very nice, something I would have forever." During the ceremony, Segal listened to the inspirational stories of prominent female athletes and the role athletics has played in shaping their lives. Segal, too, credits athletics with helping her become the person she is today. "I have become such a competitor," she says. "I do not accept failure. That feeling on the field goes hand-in-hand with what I do in my personal life and in the classroom." As team captain this season, Segal led a squad that was challenged by injury from the start. A natural and lifelong defender, Segal herself moved to midfield for some of the season. 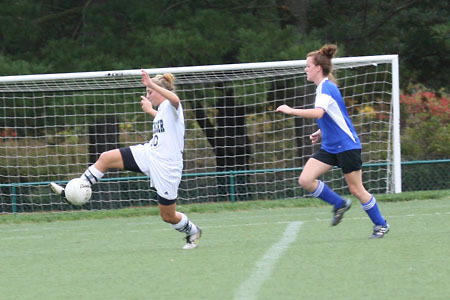 At midfield, she scored three goals and earned six assists. Other players made similar accommodations, also with good results. Considering their challenges, Segal says she is satisfied with the Vikings' achievements, which included advancing to the Region 19 final, where they lost in overtime. Segal was named to the First Team All-Region 19 and First Team All-GSAC for the second year. Segal observes that this year's squad was very different from last year's. "We lost three top players - Kasey Kenny, Carolyn Walters and Erika Juricic." But other surprises awaited, including the arrival of three players from Spain, including Christina Alonso, this year's Player of the Year for Region 19. Segal notes that the Spanish players came to Mercer more focused on footwork and tactics, while the Americans were more focused on conditioning. So, they learned from each other. "I have never played with anyone from overseas. We had so much fun," Segal said. "They taught us things about Spain and we taught them things about American culture. They were very down to earth." Finishing up her associate degree in Liberal Arts this semester, Segal is currently busy with applications to transfer schools. She is considering schools' academic programs, as well as the opportunities she will have to continue her collegiate soccer career. Her goal is to be a physician's assistant. With a 3.5 GPA, Segal has been on the Dean's List since starting at Mercer. She has learned to manage her time well, studying, playing soccer, and working in the Athletics Office. She also gives group and private lessons in soccer and lacrosse for Jersey Elite Sports Academy. "I love helping people," she says. "The opportunity to come and play at Mercer worked out great for me," she continues. "It worked out financially, playing-wise and academically." She notes that at a four-year school, freshmen must gradually work their way into the line-up, while at Mercer she hit the ground running, playing practically every minute of every game. for National Girls and Women in Sports Day. Ricciardi, left, and Asst. Coach Mike DeAngelis. Segal in action during the season. 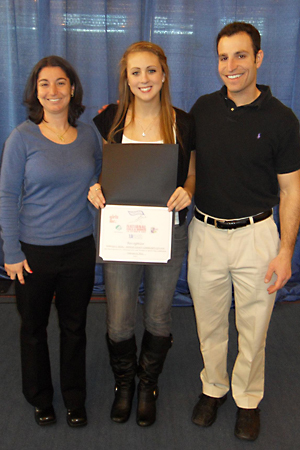 According to Coach Ricciardi, "Marissa was selected because of her outstanding job in the classroom and on the field. As team captain, she set a good example and made a huge impact on other players both on and off the field."